“Average is good” – these words would mean so different had they been said 5 or 10 years ago. My son’s pediatrician told us this when we went to see her with the 1 week old baby. He was born average weight and average height. It was weirdly reassuring to hear it from a professional. As a professional woman, I have always felt that I need to excel at both my profession and being a woman. Whatever it took to reach above average was kind of always the goal. It wasn’t about being ambitious but doing better (more than average) in the work I have chosen to do. While at the same time being able to stand on my own (more than average) as an individual and being in a relationship without losing who I am within and outside of that. In different ways and contexts, we are constantly told average equals fail. To pass you have to do more, be above average for sure but you must excel. But what if our yard stick is broken, average is actually excelling. 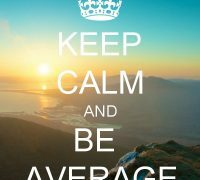 Average is not a bad thing. Average is desirable. Average is normal. Anything more is not normal. Would this improve the way we behave towards those unlike us? Would this change the way we raise our children? Would this make us innovate without competing? Would this make us treat each other with respect and not disdain or admiration? A draft approach using access to health services as an example to conceptualize the approach. Addressing inequalities through programming Inequalities of what?